Cite this guide: Brame, C., (2016). Active learning. Vanderbilt University Center for Teaching. Retrieved [todaysdate] from https://cft.vanderbilt.edu/active-learning/. What are techniques to use? In their seminal work Active Learning: Creating Excitement in the Classroom, compiled in 1991 for the Association for the Study of Higher Education and the ERIC Clearinghouse on Higher Education, Bonwell and Eison defined strategies that promote active learning as “instructional activities involving students in doing things and thinking about what they are doing” (Bonwell and Eison, 1991). Approaches that promote active learning focus more on developing students’ skills than on transmitting information and require that students do something—read, discuss, write—that requires higher-order thinking. They also tend to place some emphasis on students’ explorations of their own attitudes and values. This definition is broad, and Bonwell and Eison explicitly recognize that a range of activities can fall within it. 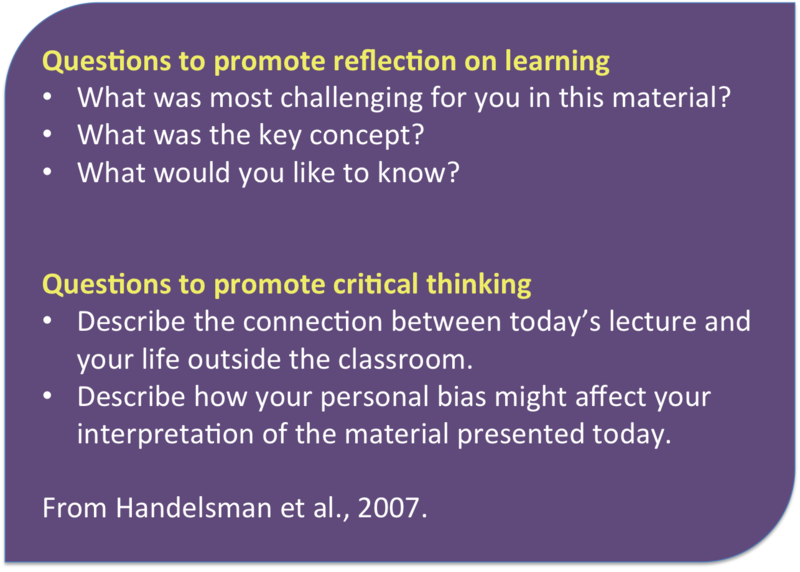 They suggest a spectrum of activities to promote active learning, ranging from very simple (e.g., pausing lecture to allow students to clarify and organize their ideas by discussing with neighbors) to more complex (e.g., using case studies as a focal point for decision-making). In their book Scientific Teaching, Handelsman, Miller and Pfund also note that the line between active learning and formative assessment is blurry and hard to define; after all, teaching that promotes students’ active learning asks students to do or produce something, which then can serve to help assess understanding (2007). The National Survey of Student Engagement (NSSE) and the Australasian Survey of Student Engagement (AUSSE) provides a very simple definition: active learning involves “students’ efforts to actively construct their knowledge.” This definition is supplemented by the items that the AUSSE uses to measure active learning: working with other students on projects during class; making a presentation; asking questions or contributing to discussions; participating in a community-based project as part of a course; working with other students outside of class on assignments; discussing ideas from a course with others outside of class; tutoring peers (reported in Carr et al., 2015). Freeman and colleagues collected written definitions of active learning from >300 people attending seminars on active learning, arriving at a consensus definition that emphasizes students’ use of higher order thinking to complete activities or participate in discussion in class (Freeman et al., 2014). Their definition also notes the frequent link between active learning and working in groups. Thus active learning is commonly defined as activities that students do to construct knowledge and understanding. 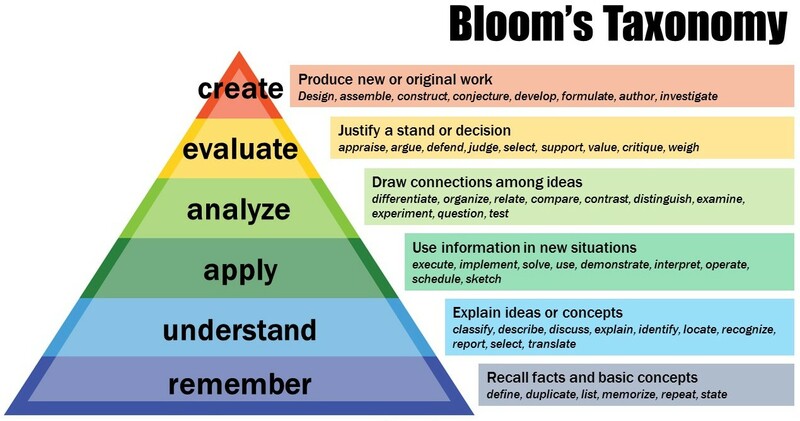 The activities vary but require students to do higher order thinking. 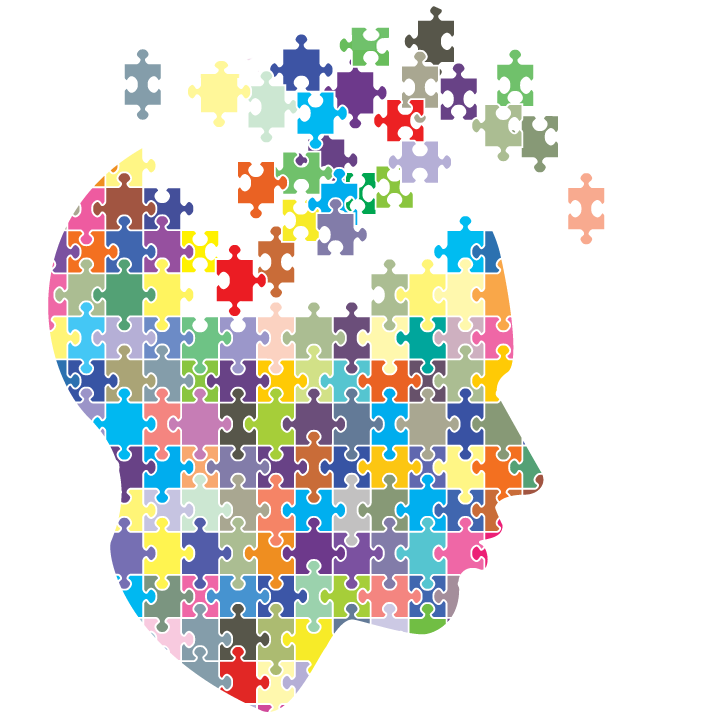 Although not always explicitly noted, metacognition—students’ thinking about their own learning—is an important element, providing the link between activity and learning. Constructivist learning theory emphasizes that individuals learn through building their own knowledge, connecting new ideas and experiences to existing knowledge and experiences to form new or enhanced understanding (Bransford et al., 1999). The theory, developed by Piaget and others, posits that learners can either assimilate new information into an existing framework, or can modify that framework to accommodate new information that contradicts prior understanding. Approaches that promote active learning often explicitly ask students to make connections between new information and their current mental models, extending their understanding. In other cases, teachers may design learning activities that allow students to confront misconceptions, helping students reconstruct their mental models based on more accurate understanding. In either case, approaches that promote active learning promote the kind of cognitive work identified as necessary for learning by constructivist learning theory. Active learning approaches also often embrace the use of cooperative learning groups, a constructivist-based practice that places particular emphasis on the contribution that social interaction can make. Lev Vygotsky’s work elucidated the relationship between cognitive processes and social activities and led to the sociocultural theory of development, which suggests that learning takes place when students solve problems beyond their current developmental level with the support of their instructor or their peers (Vygotsky 1978). Thus active learning approaches that rely on group work rest on this sociocultural branch of constructivist learning theory, leveraging peer-peer interaction to promote students’ development of extended and accurate mental models. 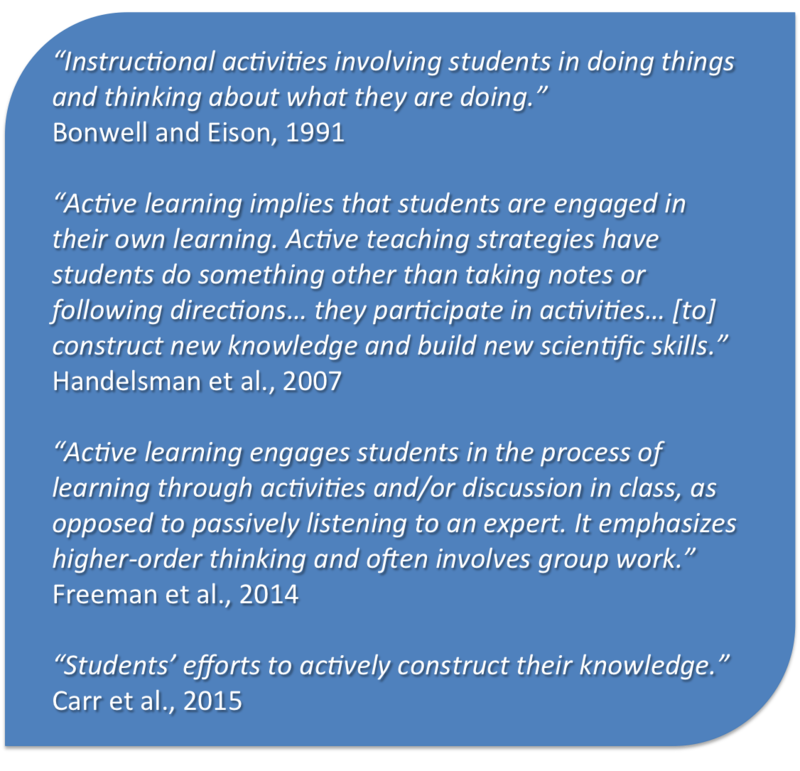 The evidence that active learning approaches help students learn more effectively than transmissionist approaches in which instructors rely on “teaching by telling” is robust and stretches back more than thirty years (see, for example, Bonwell and Eison, 1991). Here, we will focus on two reports that review and analyze multiple active learning studies. These results support other, earlier reviews (e.g., Hake, 1998; Prince, 2004; Springer et al., 1999). In one such review, Ruiz-Primo and colleagues examined published studies examining the effects of active learning approaches in undergraduate biology, chemistry, engineering and physics courses (Ruiz-Primo et al., 2011). They identified 166 studies that reported an effect size when comparing the effects of an innovation (i.e., active learning approaches) to traditional instruction that did not include the innovation. Overall, they found that inclusion of the active learning approaches improved student outcomes (mean effect size = 0.47), although there are important caveats to consider. First, the authors coded the active learning activities as conceptually oriented tasks, collaborative learning activities, technology-enabled activities, inquiry-based projects, or some combination of those four categories, and important differences existed within the categories (for example, technology-assisted inquiry-based projects on average did not produce positive effects). Second, more than 80% of the studies included were quasi-experimental rather than experimental, and the positive benefits (average effect size = 0.26) were lower for the experimental studies in which students were randomly assigned to a treatment group. Finally, many of the studies did not control for pre-existing knowledge and abilities in the treatment groups. Nonetheless, the review does provide qualified support for the inclusion of active learning approaches in instruction. While the two reviews reported focus on STEM disciplines and no similar reviews exist for the humanities and social sciences, the bulk of the evidence suggests that active learning approaches are effective across disciplines (Ambrose et al, 2010; Bonwell and Eison, 1991; Chickering and Gamson, 1987). In addition to the evidence that active learning approaches promote learning for all students, there is some evidence that active learning approaches are an effective tool in making classrooms more inclusive. Haak and colleagues examined the effects of active learning for students in the University of Washington’s Educational Opportunity Program (EOP) who were enrolled in an introductory biology course (Haak et al., 2011). Students in the EOP are educationally or economically disadvantaged, are typically the first in their families to attend college, and include most underrepresented minority students at the University of Washington. Previous work had demonstrated that the researchers could predict student grades in the introductory biology course based on their college GPA and SAT verbal score; students in the EOP had a mean failure rate of ~22% compared to a mean failure rate of ~10% for students not in the EOP. When multiple highly structured approaches to promote active learning were incorporated into the introductory biology course, all students in the course benefited, but students in the EOP demonstrated a disproportionate benefit, reducing the achievement gap to almost half of the starting level. Given the pressing need to make U.S. college classrooms more inviting and productive spaces for students from all backgrounds, these results provide another compelling reason to incorporate active learning approaches into course design. Lorenzo, Crouch, and Mazur also investigated the impact of active learning approaches on the difference in male and female performance in introductory physics classes (2006). They found that inclusion of active engagement techniques benefited all students, but had the greatest impact on female students’ performance. In fact, when they included a “high dose” of active learning approaches, the gender gap was eliminated. This result supports earlier work suggesting that women particularly benefit from active learning approaches (Laws et al., 1999; Schneider, 2001). Demonstrations—Ask students to predict the result of a demonstration, briefly discussing with a neighbor. After demonstration, ask them to discuss the observed result and how it may have differed from their prediction; follow up with instructor explanation. This approach asks students to test their understanding of a system by predicting an outcome. If their prediction is incorrect, it helps them see the misconception and thus prompts them to restructure their mental model. Think-pair-share—Ask students a question that requires higher order thinking (e.g., application, analysis, or evaluation levels within Bloom’s taxonomy). Ask students to think or write about an answer for one minute, then turn to a peer to discuss their responses for two minutes. Ask groups to share responses and follow up with instructor explanation. By asking students to explain their answer to a neighbor and to critically consider their neighbor’s responses, this approach helps students articulate newly formed mental connections. Strip sequence—Give students the steps in a process on strips of paper that are jumbled; ask them to work together to reconstruct the proper sequence. This approach can strengthen students’ logical thinking processes and test their mental model of a process. (Handelsman et al., 2007) An example from Aarhus University is provided below. 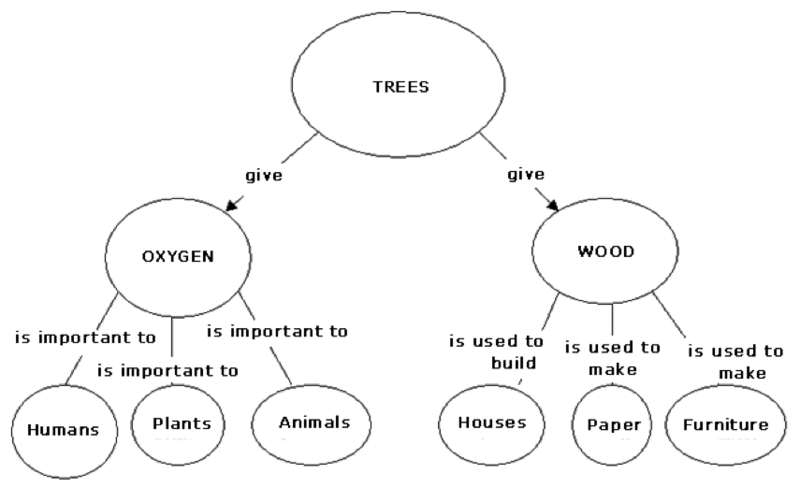 Concept map—Concept maps are visual representations of the relationships between concepts. Concepts are placed in nodes (often, circles), and the relationships between indicated by labeled arrows connecting the concepts. To have students create a concept map, identify the key concepts to be mapped in small groups or as a whole class. Ask students to determine the general relationship between the concepts and to arrange them two at a time, drawing arrows between related concepts and labeling with a short phrase to describe the relationship. By asking students to build an external representation of their mental model of a process, this approach helps students examine and strengthen the organization within the model. Further, it can emphasize the possibility of multiple “right” answers. More information and a tool to do online concept mapping can be found at the Institute for Human & Machine Cognition. (Novak and Canas, 2008) An example is shown below. Case-based learning. Much like decision-making activities, case-based learning presents students with situations from the larger world that require students to apply their knowledge to reach a conclusion about an open-ended situation. 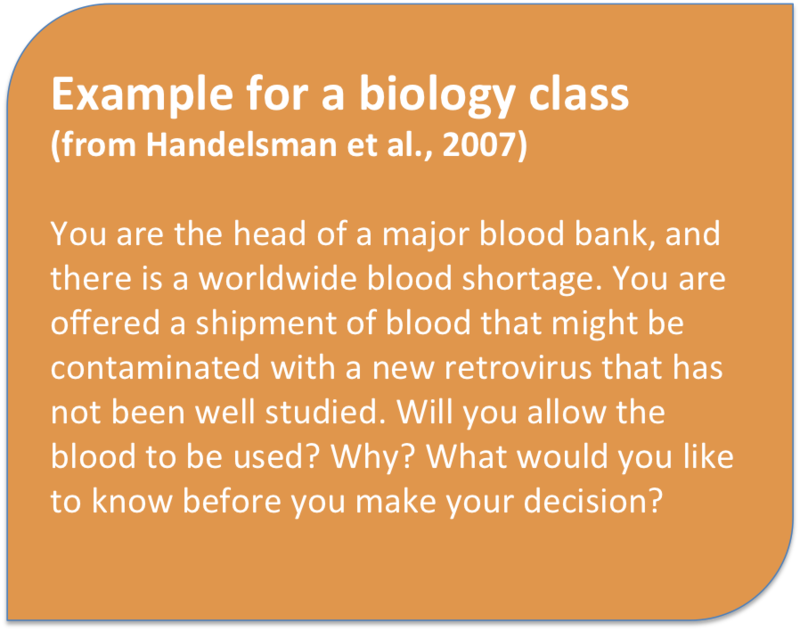 Provide students with a case, asking them to decide what they know that is relevant to the case, what other information they may need, and what impact their decisions may have, considering the broader implications of their decisions. Give small groups (3-5) of students time to consider responses, circulating to ask questions and provide help as needed. Provide opportunities for groups to share responses; the greatest value from case-based learning comes from the complexity and variety of answers that may be generated. More information and collections of cases are available at the National Center for Case Study Teaching in Science, the Case Method Website of UC-Santa Barbara, and World History Sources. Many faculty members dispense with lecture altogether, turning to discussion to prompt the kinds of thinking needed to build understanding. Elizabeth Barkley provides a large collection of discussion techniques focused on different learning goals, ranging from lower level to higher level thinking (Barkley, 2010). The CFT’s Joe Bandy has summarized some of the most useful of these techniques. There are other active learning pedagogies, many of which are highly structured and have dedicated websites and strong communities. These include team-based learning (TBL), process-oriented guided inquiry learning (POGIL), peer-led team learning, and problem-based learning (PBL). Further, the flipped classroom model is based on the idea that class time will be spent with students engaged in active learning. Start small, start early, and start with activities that pose low risk for both instructors and students. The Pause Procedure, retrieval practice, minute papers, and the think-pair-share technique provide easy entry points to incorporating active learning approaches, requiring the instructor to change very little while providing students an opportunity to organize and clarify their thinking. As you begin to incorporate these practices, it’s a good idea to explain to your students why you’re doing so; talking to your students about their learning not only helps build a supportive classroom environment, but can also help them develop their metacognitive skills (and thus their ability to become independent learners). As you consider other active learning techniques to use, use the “backwards design” approach: begin by identifying your learning goals, think about how you would identify whether students had reached them (that is, how you might structure assessment), and then choose an active learning approach that helps your students achieve those goals. Students typically have positive responses to active learning activities that are meaningful, appropriately challenging, and clearly tied to learning goals and assessments (see, for example, Lumpkin et al., 2015). Finally, consult colleagues within your department and the Center for Teaching for help and feedback as you design and implement active learning approaches. Ambrose, S.A., Bridges, M.W., DiPietro, M., Lovett, M.C., Norman, M.K., and Mayer, R.E. (2010). How learning works: seven research-based principles for smart teaching. San Francisco: Jossey-Bass. Angelo, T.A. and Cross, K.P. (1993). Classroom assessment techniques: a handbook for college teachers. San Francisco: Jossey-Bass. Barkley, E. (2010). Student engagement techniques: a handbook for college faculty. San Francisco: Jossey-Bass. Bonwell, C. C., and Eison, J.A. (1991). Active learning: creating excitement in the classroom. ASH#-ERIC Higher Education Report No. 1, Washington, D.C.: The George Washington University, School of Education and Human Development. Brame, C.J. and Biel, R. (2015). Test-enhanced learning: the potential for testing to promote greater learning in undergraduate science courses. CBE Life Sciences Education, 14, 1-12. Bransford, J.D., Brown, A.L., and Cocking, R.R. (Eds.) (1999). How people learn: Brain, mind, experience, and school. Washington, D.C.: National Academy Press. Carr, R., Palmer, S., and Hagel, P. (2015). Active learning: the importance of developing a comprehensive measure. Active Learning in Higher Education 16, 173-186. Crouch, C.H. and Mazur, E. (2001). Peer instruction: ten years of experience and results. Am. Journal of Physics 69, 970-977. Fagen, A.P., Crouch, C.H., and Mazur, E. (2002). Peer instruction: results from a range of classrooms. Physics Teacher 40, 206-209. Freeman, S., Eddy, S.L., McDonough, M., Smith, M.K., Okoroafor, N., Jordt, H., and Wenderoth, M.P. (2014). Active learning increases student performance in science, engineering, and mathematics. Proceedings of the National Academy of Sciences USA 111, 8410-8415. Haak, D.C., HilleRisLambers, J., Pitre, E., and Freeman, S. (2011). Increased structure and active learning reduce the achievement gap in introductory biology. Science 332, 1213–1216. Hake, R. (1998). Interactive-engagement versus traditional methods: A six-thousand-student survey of mechanics test data for introductory physics courses. American Journal of Physics 66, 64-74. Handelsman, J., Miller, S., and Pfund, C. (2007). Scientific teaching. New York: W.H. Freeman. Hyman, R.T. (1980). Improving discussion leadership. New York: Columbia University Teachers College Press. Laws, P., Rosborough P, and Poodry, F. (1999).Women’s responses to an activity-based introductory physics program. American Journal of Physics 67, S32–S37. Lorenzo, M., Crouch, C.H., Mazur, E. (2006). Reducing the gender gap in the physics classroom. American Journal of Physics 74, 118–122. Lumpkin, A., Achen, R., and Dodd,R. (2015). Student perceptions of active learning. College Student Journal 49, 121-133. Novak, J.D. and Canas, A.J. (2008). The theory underlying concept maps and how to construct and use them. Technical Report IHMC CmapTools 2006-01 Rev 2008-01 (retrieved from http://cmap.ihmc.us/docs/theory-of-concept-maps). Prince, M. (2004). 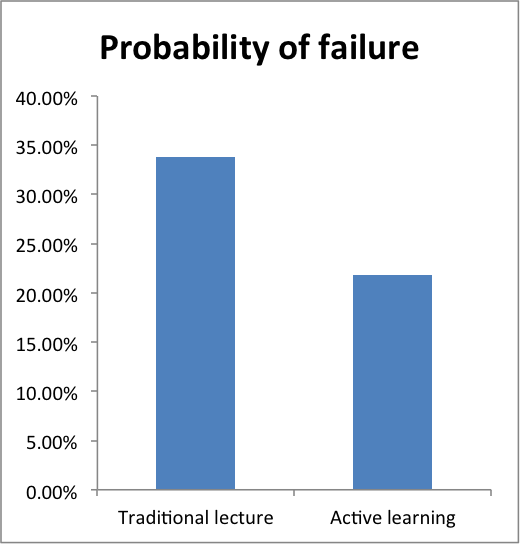 Does active learning work? A review of the research. Journal of Engineering Education 93, 223-231. Rowe, M.B. (1980). Pausing principles and their effects on reasoning in science. In Teaching the Sciences, edited by F. B. Brawer. New Directions for Community Colleges No. 31. San Francisco: Jossey-Bass. Ruhl, K., Hughes, C.A., and Schloss, P.J. (1987). Using the Pause Procedure to enhance lecture rcall. Teacher Education and Special Education 10, 14-18. Ruiz-Primo, M.A., Briggs, D., Iverson, H., Talbot, R., Shepard, L.A. (2011). Impact of undergraduate science course innovations on learning. Science 331, 1269–1270. Schneider, M. (2001). Encouragement of women physics majors at Grinnell College: A case study. Phys. Teach. 39, 280–282. Springer, L., Stanne, M.E., Donovan, S.S. (1999). Effects of small-group learning on undergraduates in science, mathematics, engineering, and technology. Rev. Educ. Res. 69, 21–51.